Where are the ideal places in the U.S. to grow olives? Olive trees need a subtropical climate and do best with mild winters and long, warm, and dry summers. They are sensitive to hard freezing environments. 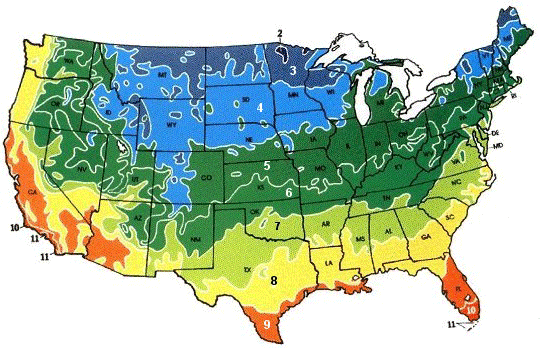 They will grow in climate zones 10 and 11 (see map below). Some varieties are hardy enough for zone 9 or even 8. Temperatures below 22ºF (-5ºC) will kill small wood and branches. Freezing conditions lasting days or a hard freeze, below 15ºF (-10ºC), will kill or severely damage an olive tree. It is best to avoid planting olive trees in situations where there is a high risk of frost during bloom (late April to mid-May) or where freezing conditions are likely before harvest. Summer rainfall can cause fungal and bacterial infestations. Can I grow my olive trees indoors?You could grow a tree "bonsai style" and keep it indoors and we have heard of people who have trees in large containers who move them indoors or into a hothouse during very cold weather but this is impractical for most growers. Although olive trees are non-deciduous, they do require a cold period to go into semi-dormancy. If you have a winter month where the average daily temperature is below 54 degrees or less, the tree will get the message to slow growth and change gears for flowering in the spring. Where are the ideal places in the U.S. to grow olives?Finally, there can be substantial microclimate differences within one orchard. Small valleys, in particular, can be substantially colder than more open areas and may make a difference between having frost damage or not. -46 to -40ºC (-50 to -40ºF)? -40 to -34ºC (-40 to -30ºF)? -34 to -29ºC (-30 to -20ºF)? -29 to -23ºC (-20 to -10ºF)? -23 to -18ºC (-10 to 0ºF)? -18 to -12ºC (0 to 10ºF)? -12 to -7ºC (10 to 20ºF)? -7 to -1ºC (20 to 30ºF)? -1 to 4ºC (30 to 40ºF)? Olive trees prefer non-stratified, moderately fine textured soils, including sandy loam, loam, silt loam, clay loam, and silty clay loam. Such soils provide aeration for root growth, are quite permeable and have a high water holding capacity. Sandier soils do not have good nutrient or water holding capacity. Heavier clays often do not have adequate aeration for root growth and will not drain well. Olive trees are shallow rooted and do not require very deep soils to produce well. Soils having an unstratified structure of four feet are suitable for olives. Stratified soils, either cemented hardpan or varying soil textures within the described profile, impede water movement and may develop saturated layers that damage olive roots and should be ripped. Olives tolerate soils of varying chemical quality. Trees produce well on moderately acid (pH greater than 5) or moderately basic (pH less than 8.5) soils. Basic (alkaline) or sodic soils should be avoided since their poor structure prevents water penetration and drainage, creating saturated soil conditions that kill olive roots. Southern exposures in the West and Southern United States will give better yields and protect from freezes. Olives can be grown on steep inclines or terraced, although access and mechanical harvesting, spraying, and other orchard maintenance chores can be difficult and more costly. There has been debate on whether terraced trees should be placed on the edge of the terrace or against the hillside. Inclines greater than 20 degrees are inappropriate for most tractors and other vehicles. Inclined properties cannot be assumed to have good drainage. Dig a hole and fill it with water to do your own "perc" test to see if the water drains. Before choosing a site, consider the properties around it. Factors to look for include (but are not limited to) organic buffer zone and run-off issues if you intend to grow the trees organically, pest sources such as untreated olive trees infested with the olive fly, dead native growth that may carry boring beetle, grass hopper or weevil infestations, and other damage vectors such as wild pigs, gophers, or ground squirrels. G. Steven Sibbett and Louise Ferguson: Olive Production Manual, University of California.